The Ingenious Writers Contest was organized during the winter 2017 semester by SARA, Direction des affaires professorales, de la recherche et des partenariats (DAPRP), and Substance ÉTS. This contest asked students to summarize a scientific article written by an ÉTS professor in 1200 words or less, with the goal of making the content accessible to an informed reader who is not necessarily an expert in the field. A committee consisting of ÉTS professors and employees evaluated the 31 papers submitted by students. The committee had a difficult time determining the winners, as we received many texts of excellent quality. The chosen winners each distinguished themselves with particular nuances in how they summarized the original articles in a clear and interesting way, while they maintained important aspects of the original thread, and still made the research accessible to a non expert reader. 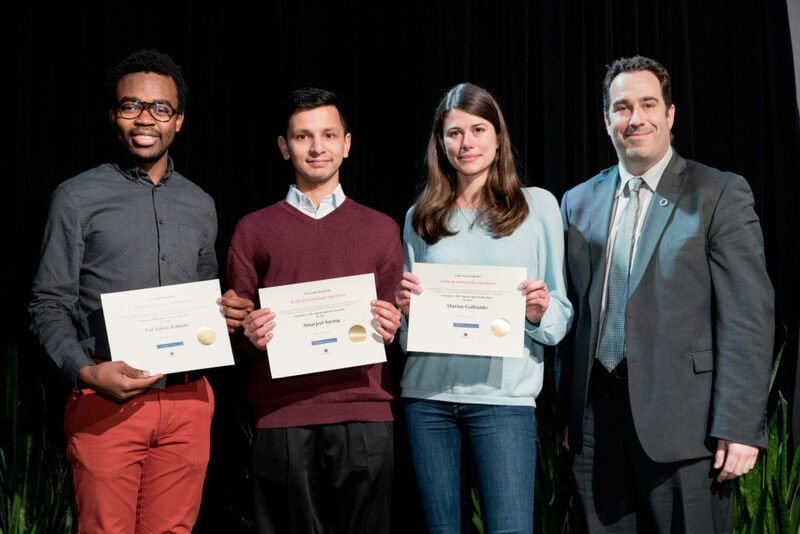 Ingenious Writers Contest awards were given during the Gala de la reconnaissance de l’ÉTS (left to right) : Ted Julien Tchinde Fotsin (1st place), Smarjeet Sharma (2nd place), Marion Ghibaudo (3rd place), Sylvain G. Cloutier (Directeur des affaires professorales, de la recherche et des partenariats). 3rd place ($500) : Marion Ghibaudo for her text Impacts des changements climatiques sur la rénovation et la conception des bâtiments de demain which summarizes an article cowritten by professor Claudiane Ouellet-Plamondon. During the summer of 2017, many of the texts submitted to the contest will be published in Substance ÉTS in order to make them available to as many people as possible. Look at Substance to discover them and learn about research at ETS!